From Tile, to remodeling, to complete bathroom redesign, the experts at A&B can build your dream. 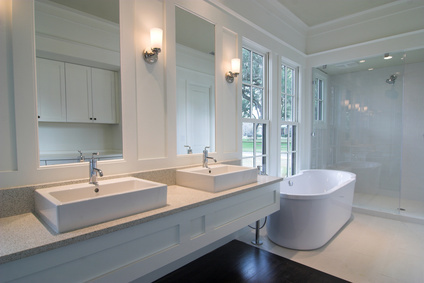 It takes a team of bathroom designers with years of experience to produce a quality bathroom remodel. The experts at Above and Beyond have years of experience working with local customers in the Albuquerque area. We use only the highest quality materials and craftsmanship, and have a personal touch that will ensure you’re bathroom is remodeled just like you dreamed it would be, regardless of the size of your bathroom and within your budget. Creating a vanity or remodeling a vanity, is a great way to make your bathroom feel more accesible. Above and Beyond can help you design a vanity that will serve as a focal point while still matching your other bathroom appliances. Depending on the current set up of your bathroom, we can make your vanity fit in perfectly with the countertops you already have, or start from fresh and incorporate your vanity right into your counter top! The last piece of your bathroom remodeling project is to choose the tile that will tie it all together. You can use as much or as little tile as you like to cover your floors, walls, and countertops! Choose the size, color, and design for the tile you want.